Download "Energy Management. Driving Value in Industrial Environments. 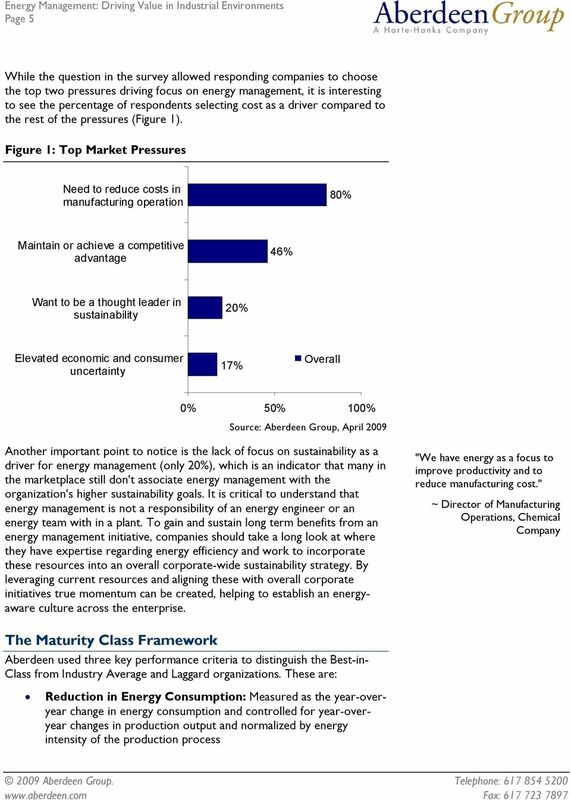 April 2009 Mehul Shah, Matthew Littlefield"
4 Page 4 Chapter One: Benchmarking the Best-in-Class Business Context The volatile price of energy has put increasing pressure on the executives in the energy intensive industries. It is now more important than ever to understand a plant's energy's needs and cut out wasteful energy consumption wherever possible so that companies can improve predictability into energy usage. Organizations realize that they can only pass on some energy increases to their customers and need to look within to reduce cost and consumption. 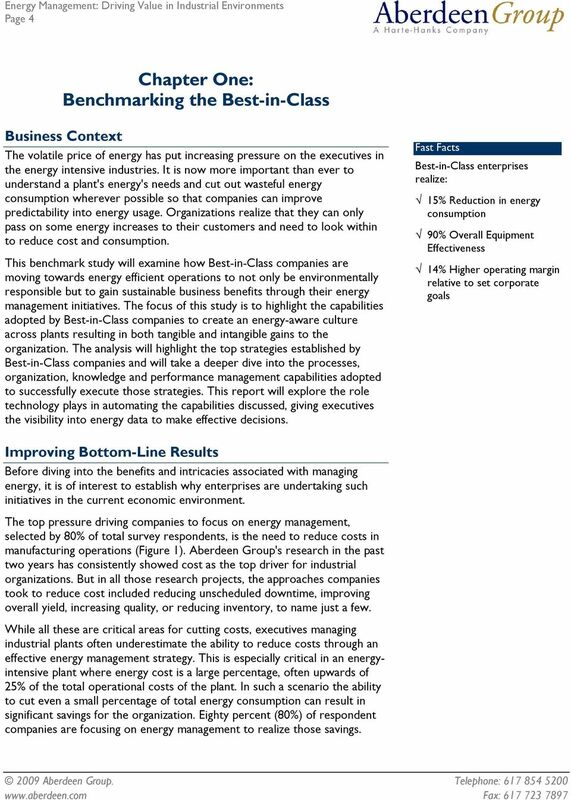 This benchmark study will examine how Best-in-Class companies are moving towards energy efficient operations to not only be environmentally responsible but to gain sustainable business benefits through their energy management initiatives. 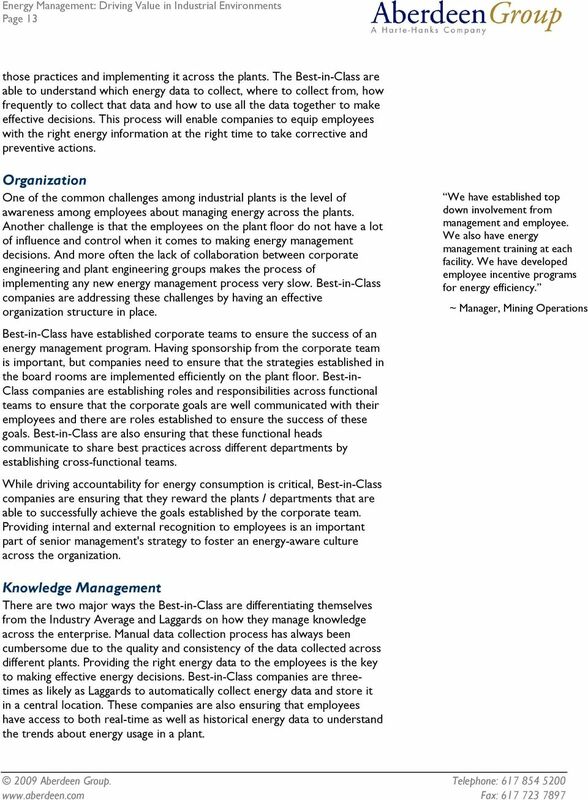 The focus of this study is to highlight the capabilities adopted by Best-in-Class companies to create an energy-aware culture across plants resulting in both tangible and intangible gains to the organization. The analysis will highlight the top strategies established by Best-in-Class companies and will take a deeper dive into the processes, organization, knowledge and performance management capabilities adopted to successfully execute those strategies. This report will explore the role technology plays in automating the capabilities discussed, giving executives the visibility into energy data to make effective decisions. Fast Facts Best-in-Class enterprises realize: 15% Reduction in energy consumption 90% Overall Equipment Effectiveness 14% Higher operating margin relative to set corporate goals Improving Bottom-Line Results Before diving into the benefits and intricacies associated with managing energy, it is of interest to establish why enterprises are undertaking such initiatives in the current economic environment. The top pressure driving companies to focus on energy management, selected by 80% of total survey respondents, is the need to reduce costs in manufacturing operations (Figure 1). Aberdeen Group's research in the past two years has consistently showed cost as the top driver for industrial organizations. But in all those research projects, the approaches companies took to reduce cost included reducing unscheduled downtime, improving overall yield, increasing quality, or reducing inventory, to name just a few. While all these are critical areas for cutting costs, executives managing industrial plants often underestimate the ability to reduce costs through an effective energy management strategy. This is especially critical in an energyintensive plant where energy cost is a large percentage, often upwards of 25% of the total operational costs of the plant. In such a scenario the ability to cut even a small percentage of total energy consumption can result in significant savings for the organization. Eighty percent (80%) of respondent companies are focusing on energy management to realize those savings. 6 Page 6 Overall Equipment Effectiveness (OEE): Composite metric accounting for availability, performance, and quality Operating Margin: Measured as operating margin realized relative to the corporate goals established The three KPIs used to determine Best-in-Class companies are critical to measure success of any energy management initiative, as it not only takes into consideration how effectively a plant is managing energy but also considers operational metrics, which includes quality, availability and throughput, and corporate metrics. Table 1: Top Performers Earn Best-in-Class Status Definition of Maturity Class Best-in-Class: Top 20% of aggregate performance scorers Industry Average: Middle 50% of aggregate performance scorers Laggard: Bottom 30% of aggregate performance scorers Mean Class Performance 90% Overall Equipment Effectiveness 15% Reduction in Energy Consumption 14% Margin 80% Overall Equipment Effectiveness 7% Reduction in Energy Consumption 2% Margin 66% Overall Equipment Effectiveness 6% Increase in Energy Consumption -9% Margin Best-in-Class companies are able to effectively manage energy by reducing energy consumption by 15%, while realizing 90% OEE and outperforming corporate targets for operating margins by 14%. Best-in-Class companies are not only able to reduce energy consumption, but are also able to successfully translate these into operational and financial gains for the organization. Underperforming companies should use this research to understand the steps taken by their Best-in-Class peers and implement those practices in their strategic as well as tactical actions to realize such improved performance. "Our energy management initiatives are around optimizing processes that generate steam to reduce natural gas consumption." 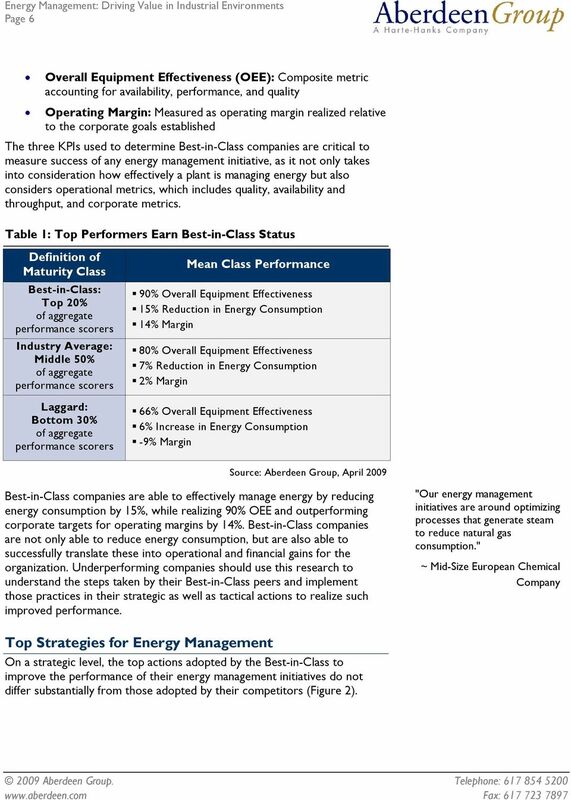 ~ Mid-Size European Chemical Company Top Strategies for Energy Management On a strategic level, the top actions adopted by the Best-in-Class to improve the performance of their energy management initiatives do not differ substantially from those adopted by their competitors (Figure 2). 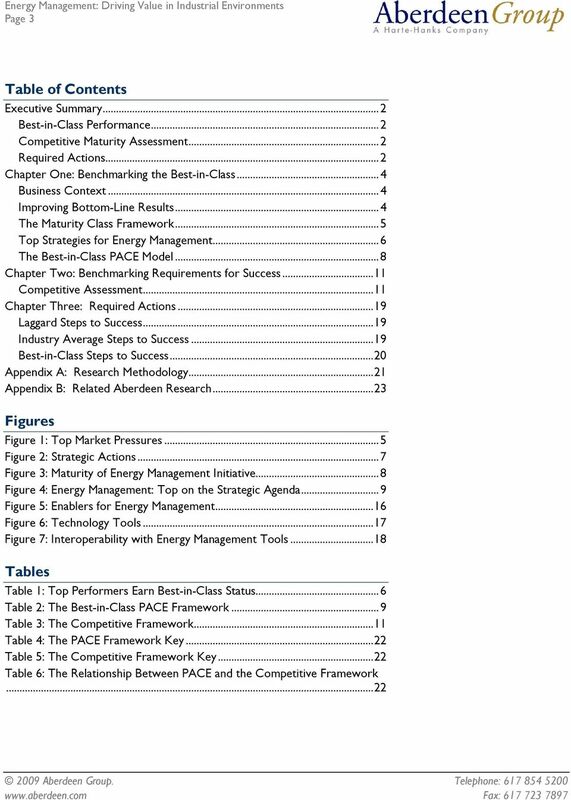 8 Page 8 Figure 3: Maturity of Energy Management Initiative 100% 50% 8% 5% 26% 26% 11% 19% 0% 49% BIC More than 3 years Less than 1 year 38% Others 1 to 3 Years Currently in Planning Stages The findings in Figure 2 show that the top strategy adopted for a successful energy management initiative is the exact same for a majority of responding companies, irrespective of the performance. But there can be a dramatic difference in pursuing a strategy and how you execute a strategy. One of the possible reasons might also be related to how long a particular company has been pursuing an energy management initiative (Figure 3). But just to be clear, the amount of time spent pursing a specific strategy isn't an inherent basis for performance differentiation itself. The longer a company is in the energy management journey, the more opportunity an organization gets to understand and establish best practices as compared to their peers. The next chapter will highlight the best practices adopted by Best-in-Class companies resulting in improved overall performance. 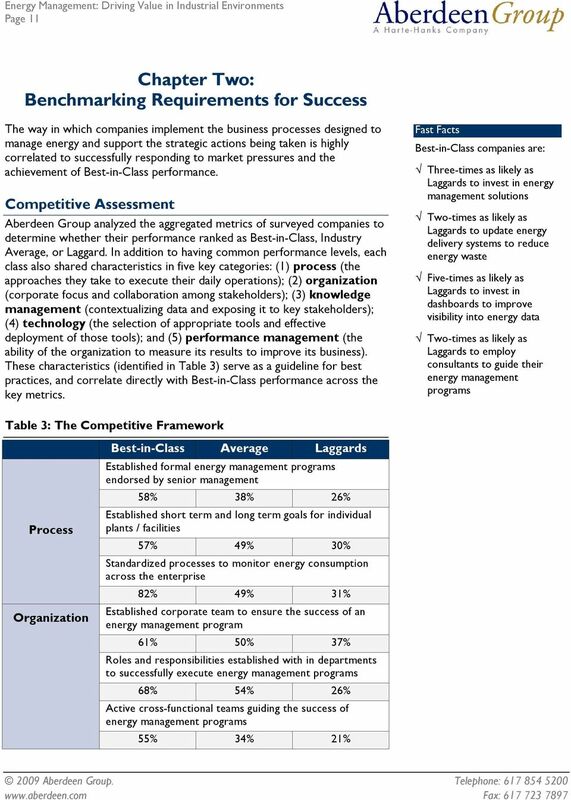 The Best-in-Class PACE Model How do the Best-in-Class manage energy and achieve high level of operational and financial performance as discussed in Table 1? The answer involves a combination of adjustments to the day-to-day process, support from senior management and collaboration across functional groups, coordination of knowledge related to energy, and investments in supporting technologies to provide data to appropriate decision makers. 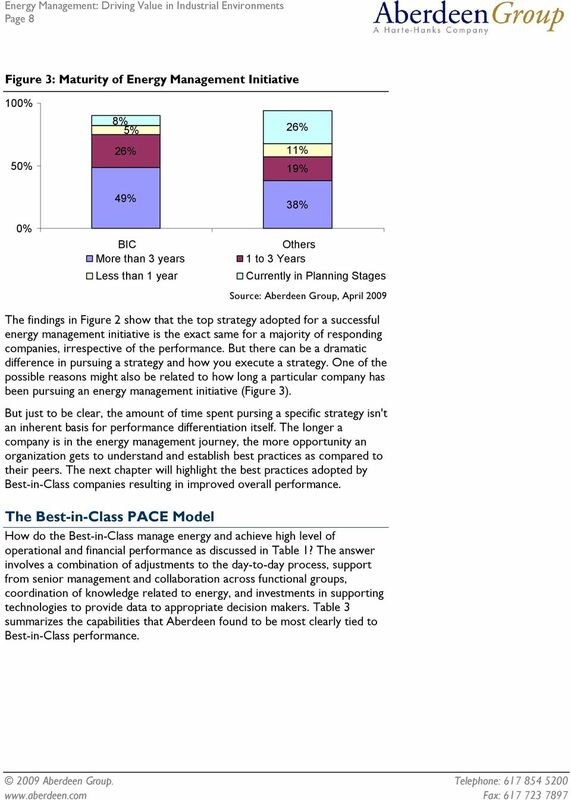 Table 3 summarizes the capabilities that Aberdeen found to be most clearly tied to Best-in-Class performance. 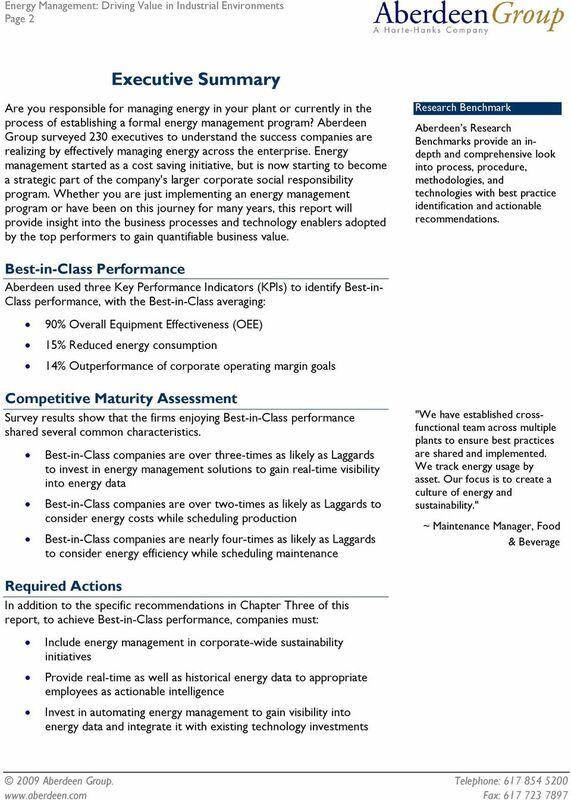 10 Page 10 Aberdeen Insights Strategy Best-in-Class companies are found to be more than two-times as likely as Laggards to have energy management as one of the top three focuses of company's strategic agenda and are also two-times as likely to establish an energy-aware culture across the enterprise. 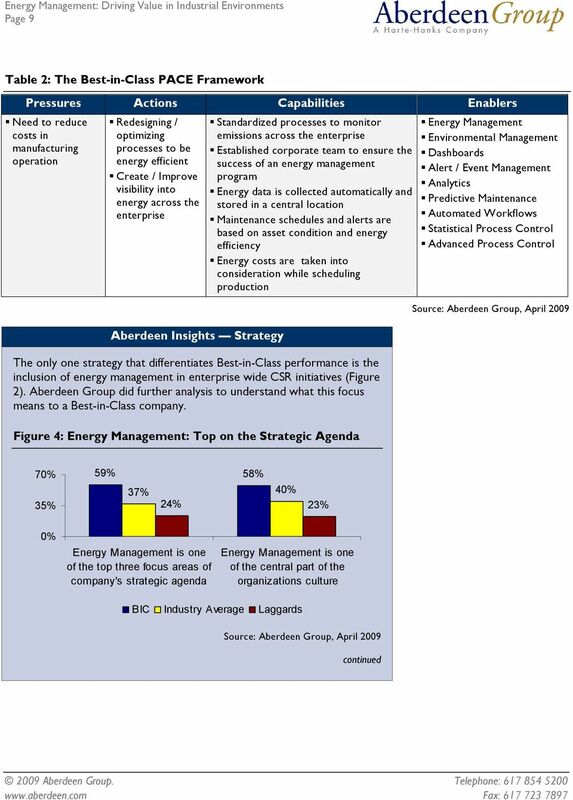 This tells a lot about the focus and importance energy management initiatives are given in a Bestin-Class organization. Both these actions are the foundation to the success Best-in-Class companies are enjoying with their energy management initiatives. 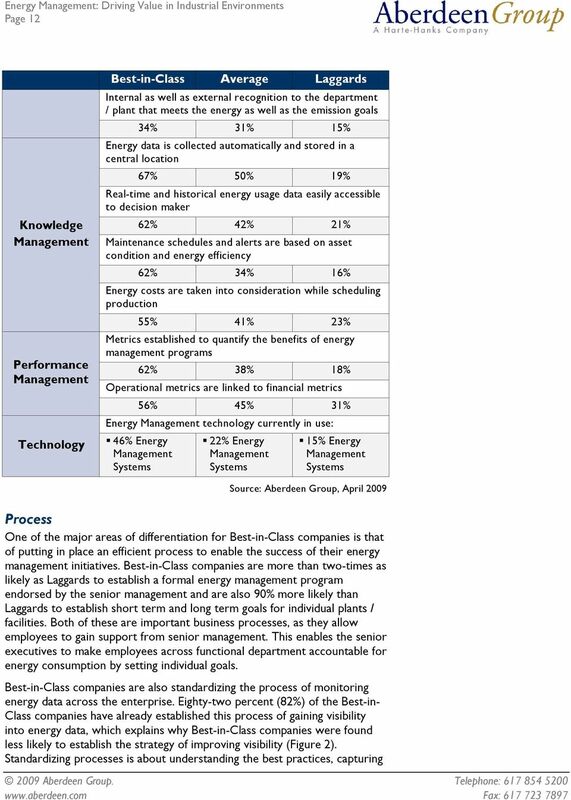 By having both the above capabilities, Best-in- Class companies are not only making sure that the energy management programs are supported by senior management, but are also ensuring that all the employees are bought into such initiatives and are actively pursuing it in their day-to-day activities. Establishing such a holistic approach will help companies to gain and, more importantly, sustain the benefits achieved from an energy management program. The next chapter will highlight the business processes established by Bestin-Class companies to create an energy aware culture across the enterprise. 13 Page 13 those practices and implementing it across the plants. The Best-in-Class are able to understand which energy data to collect, where to collect from, how frequently to collect that data and how to use all the data together to make effective decisions. This process will enable companies to equip employees with the right energy information at the right time to take corrective and preventive actions. Organization One of the common challenges among industrial plants is the level of awareness among employees about managing energy across the plants. Another challenge is that the employees on the plant floor do not have a lot of influence and control when it comes to making energy management decisions. And more often the lack of collaboration between corporate engineering and plant engineering groups makes the process of implementing any new energy management process very slow. Best-in-Class companies are addressing these challenges by having an effective organization structure in place. 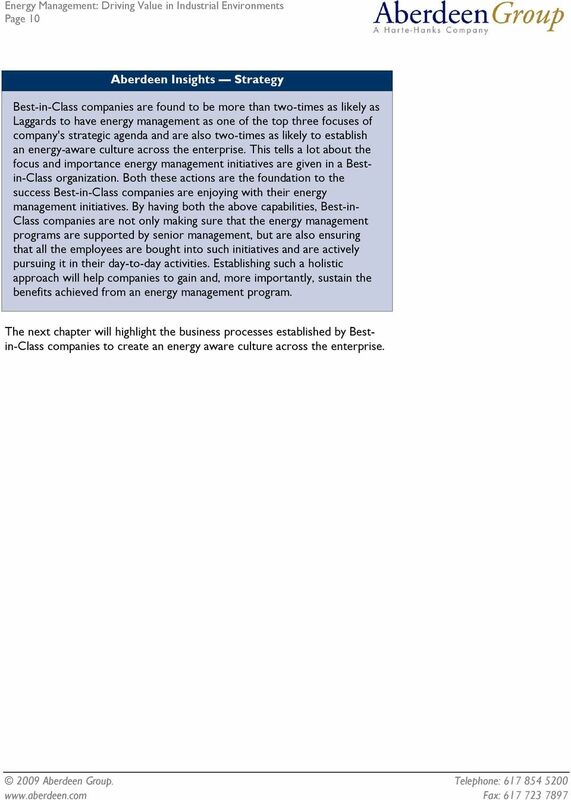 Best-in-Class have established corporate teams to ensure the success of an energy management program. Having sponsorship from the corporate team is important, but companies need to ensure that the strategies established in the board rooms are implemented efficiently on the plant floor. Best-in- Class companies are establishing roles and responsibilities across functional teams to ensure that the corporate goals are well communicated with their employees and there are roles established to ensure the success of these goals. Best-in-Class are also ensuring that these functional heads communicate to share best practices across different departments by establishing cross-functional teams. While driving accountability for energy consumption is critical, Best-in-Class companies are ensuring that they reward the plants / departments that are able to successfully achieve the goals established by the corporate team. Providing internal and external recognition to employees is an important part of senior management's strategy to foster an energy-aware culture across the organization. We have established top down involvement from management and employee. We also have energy management training at each facility. We have developed employee incentive programs for energy efficiency. ~ Manager, Mining Operations Knowledge Management There are two major ways the Best-in-Class are differentiating themselves from the Industry Average and Laggards on how they manage knowledge across the enterprise. Manual data collection process has always been cumbersome due to the quality and consistency of the data collected across different plants. Providing the right energy data to the employees is the key to making effective energy decisions. Best-in-Class companies are threetimes as likely as Laggards to automatically collect energy data and store it in a central location. These companies are also ensuring that employees have access to both real-time as well as historical energy data to understand the trends about energy usage in a plant. 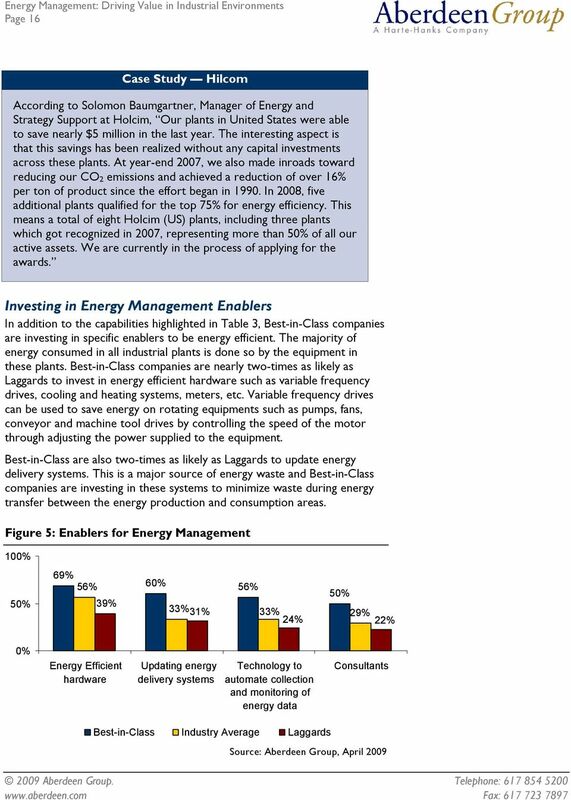 17 Page 17 Best-in-Class companies are also more likely to get external help by employing consultants to help with implementing an energy management program. These external consultants provide value through plant audits, helping executives to understand the gaps in energy management process and also provide some critical recommendations on the steps required to make the plant more energy efficient. The next stage for these consultants is to become a part of the plant's internal team to successfully execute the recommendations provided and sustain the short-term gains made. An important differentiator for Best-in-Class companies is the ability to improve visibility into energy data to make effective decisions. Best-in-Class companies are able to have such visibility by investing in technology to automate the collection and monitoring of energy data. 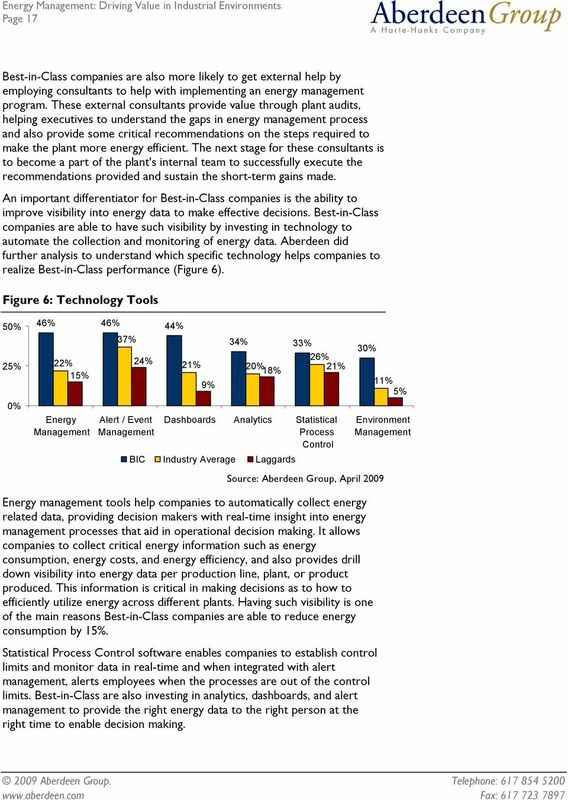 Aberdeen did further analysis to understand which specific technology helps companies to realize Best-in-Class performance (Figure 6). Figure 6: Technology Tools 50% 25% 0% 46% 46% 44% 22% 15% Energy Management 37% 24% Alert / Event Management 34% 33% 21% 20% 18% 9% 26% 21% Dashboards Analytics Statistical Process Control BIC Industry Average Laggards 30% 11% 5% Environment Management Energy management tools help companies to automatically collect energy related data, providing decision makers with real-time insight into energy management processes that aid in operational decision making. It allows companies to collect critical energy information such as energy consumption, energy costs, and energy efficiency, and also provides drill down visibility into energy data per production line, plant, or product produced. This information is critical in making decisions as to how to efficiently utilize energy across different plants. Having such visibility is one of the main reasons Best-in-Class companies are able to reduce energy consumption by 15%. Statistical Process Control software enables companies to establish control limits and monitor data in real-time and when integrated with alert management, alerts employees when the processes are out of the control limits. Best-in-Class are also investing in analytics, dashboards, and alert management to provide the right energy data to the right person at the right time to enable decision making. 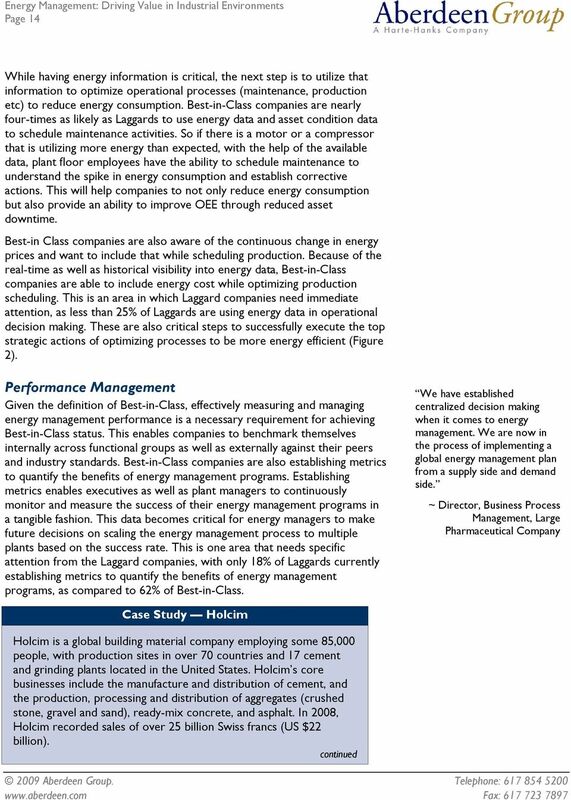 18 Page 18 Aberdeen Insights Technology While investing in energy management tools is important for Best-in- Class performance, as shown in Figure 6, one of the a major differentiators for Best-in-Class companies has been their ability to use energy data to optimize production and maintenance processes. To enable that, Best-in-Class companies are establishing real-time interoperability between their energy management systems and the technologies mentioned in Figure 7. 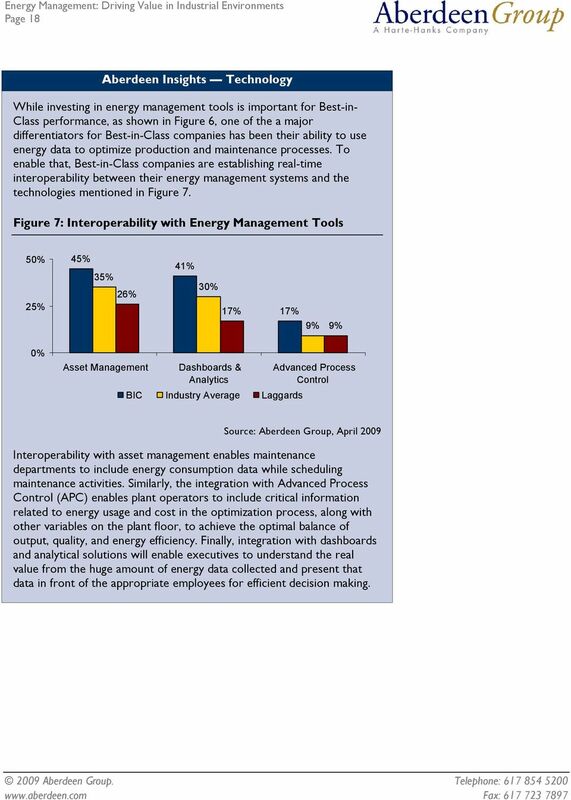 Figure 7: Interoperability with Energy Management Tools 50% 25% 45% 35% 26% 41% 30% 17% 17% 9% 9% 0% Asset Management Dashboards & Advanced Process Analytics Control BIC Industry Average Laggards Interoperability with asset management enables maintenance departments to include energy consumption data while scheduling maintenance activities. Similarly, the integration with Advanced Process Control (APC) enables plant operators to include critical information related to energy usage and cost in the optimization process, along with other variables on the plant floor, to achieve the optimal balance of output, quality, and energy efficiency. Finally, integration with dashboards and analytical solutions will enable executives to understand the real value from the huge amount of energy data collected and present that data in front of the appropriate employees for efficient decision making. 20 Page 20 that data to optimize production scheduling. This will ensure that production is scheduled when the energy costs are low, thereby driving annual energy costs lower. 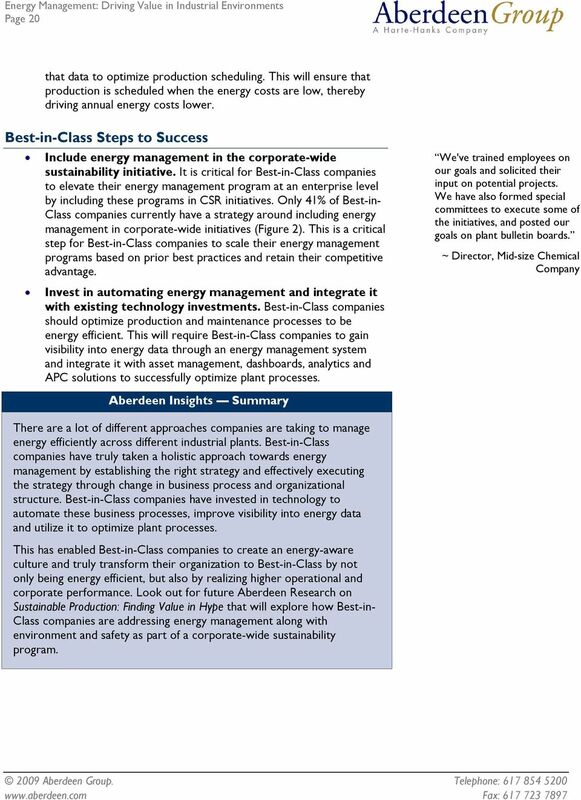 Best-in-Class Steps to Success Include energy management in the corporate-wide sustainability initiative. It is critical for Best-in-Class companies to elevate their energy management program at an enterprise level by including these programs in CSR initiatives. 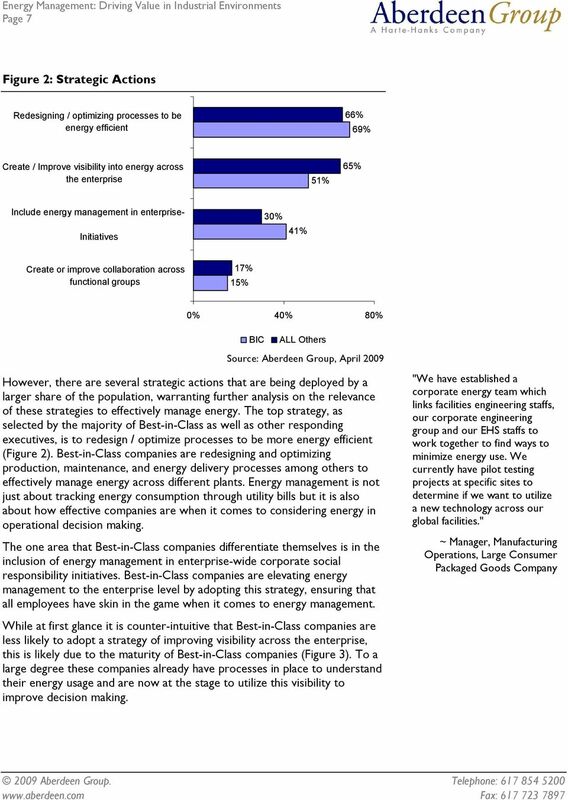 Only 41% of Best-in- Class companies currently have a strategy around including energy management in corporate-wide initiatives (Figure 2). 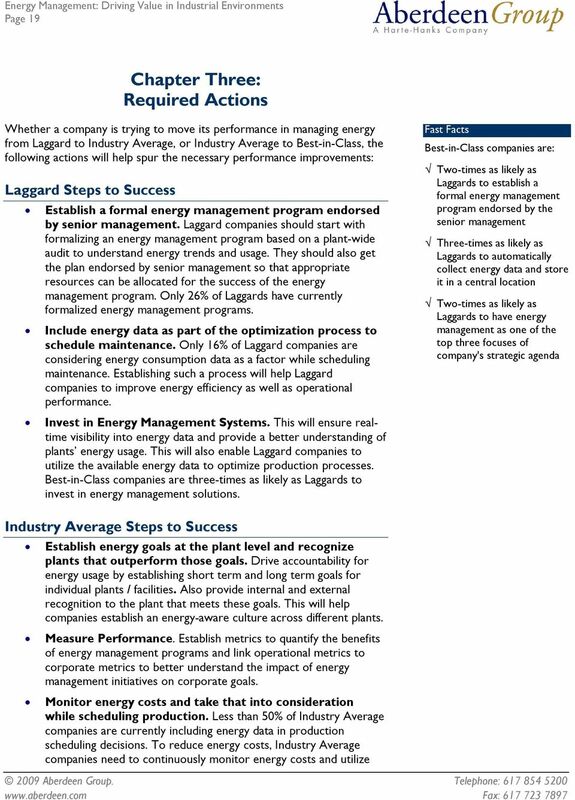 This is a critical step for Best-in-Class companies to scale their energy management programs based on prior best practices and retain their competitive advantage. Invest in automating energy management and integrate it with existing technology investments. Best-in-Class companies should optimize production and maintenance processes to be energy efficient. This will require Best-in-Class companies to gain visibility into energy data through an energy management system and integrate it with asset management, dashboards, analytics and APC solutions to successfully optimize plant processes. We've trained employees on our goals and solicited their input on potential projects. We have also formed special committees to execute some of the initiatives, and posted our goals on plant bulletin boards. ~ Director, Mid-size Chemical Company Aberdeen Insights Summary There are a lot of different approaches companies are taking to manage energy efficiently across different industrial plants. Best-in-Class companies have truly taken a holistic approach towards energy management by establishing the right strategy and effectively executing the strategy through change in business process and organizational structure. Best-in-Class companies have invested in technology to automate these business processes, improve visibility into energy data and utilize it to optimize plant processes. This has enabled Best-in-Class companies to create an energy-aware culture and truly transform their organization to Best-in-Class by not only being energy efficient, but also by realizing higher operational and corporate performance. Look out for future Aberdeen Research on Sustainable Production: Finding Value in Hype that will explore how Best-in- Class companies are addressing energy management along with environment and safety as part of a corporate-wide sustainability program. 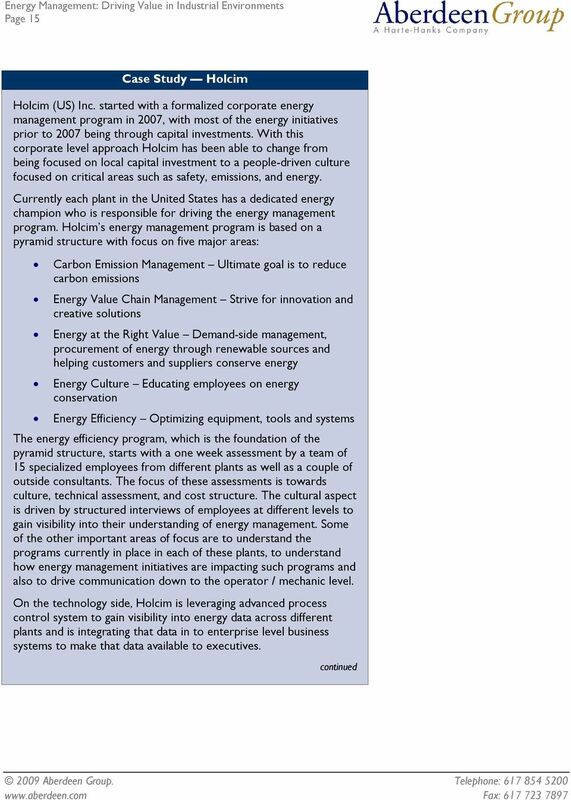 21 Page 21 Appendix A: Research Methodology Between February and March 2009, Aberdeen examined the use, the experiences, and the intentions of more than 250 enterprises with and without energy management initiatives in a diverse set of enterprises. Aberdeen supplemented this online survey effort with telephone interviews with select survey respondents, gathering additional information on energy management strategies, experiences, and results. Responding enterprises included the following: Job title / function: The research sample included respondents with the following job titles: senior management (CxO, VP, etc.) (13%); Director (15%); Manager (43%); Staff (17%); consultants (5%); other (7%). Industry: The research sample included respondents from the following industries: Food and Beverage (18%); Automotive (15%); Chemicals (15%); Industrial Equipment Mfg (11%); Metals (9%); Mining (8%); Energy (7%); Utilities (6%); Oil and Gas (5%). Geography: The majority of respondents (68%) were from North America. Most other respondents were from the Asia-Pacific region (11%) and Europe (15%). Company size: Thirty percent (30%) of respondents were from large enterprises (annual revenues above US $1 billion); 40% were from midsize enterprises (annual revenues between $50 million and $1 billion); and 30% of respondents were from small businesses (annual revenues of $50 million or less). Headcount: Twenty percent (20%) of respondents were from small enterprises (headcount between 1 and 99 employees); 38% were from midsize enterprises (headcount between 100 and 999 employees); and 42% of respondents were from large businesses (headcount greater than 1,000 employees). Solution providers recognized as sponsors were solicited after the fact and had no substantive influence on the direction of this report. Their sponsorship has made it possible for Aberdeen Group to make these findings available to readers at no charge. Study Focus Responding executives completed an online survey that included questions designed to determine the following: The maturity of energy management initiatives and the performance improvement garnered from such initiatives The structure and effectiveness of existing energy management initiatives Current and planned use of technology to effectively manage energy The study aimed to identify emerging best practices to manage energy in an industrial environment, and to provide a framework by which readers could assess their own management capabilities. 23 Page 23 Appendix B: Related Aberdeen Research Related Aberdeen research that forms a companion or reference to this report includes: A Platform Approach to Manufacturing Operations Management; March 2009 Managing Risks in Asset Intensive Operations; March 2009 Sustainability Matters: The Corporate Executives Strategic Agenda; March 2009 The Cost of Quality: Defining the Value of Enterprise Quality Management; August 2008 Compliance and Traceability in Real-Time: Accelerating the Speed of Business; December, 2008 Manufacturing Operations Management: The Next Generation of Manufacturing System; January 2008 Event Driven Manufacturing Intelligence: Creating Closed Loop Performance Management; May 2008 Global Manufacturing Operations Management; August 2008 Building a Green Supply Chain: Social Responsibility for Fun and Profit; March 2008 Information on these and any other Aberdeen publications can be found at Authors: Mehul Shah, Research Analyst, Matthew Littlefield, Senior Research Analyst, Since 1988, Aberdeen's research has been helping corporations worldwide become Best in Class. Having benchmarked the performance of more than 644,000 companies, Aberdeen is uniquely positioned to provide organizations with the facts that matter the facts that enable companies to get ahead and drive results. That's why our research is relied on by more than 2.2 million readers in over 40 countries, 90% of the Fortune 1,000, and 93% of the Technology 500. As a Harte Hanks Company, Aberdeen plays a key role of putting content in context for the global direct and targeted marketing company. Aberdeen's analytical and independent view of the "customer optimization" process of Harte Hanks (Information Opportunity Insight Engagement Interaction) extends the client value and accentuates the strategic role Harte Hanks brings to the market. For additional information, visit Aberdeen or call (617) , or to learn more about Harte Hanks, call (800) or go to hanks.com. This document is the result of primary research performed by Aberdeen Group. Aberdeen Group's methodologies provide for objective fact based research and represent the best analysis available at the time of publication. Unless otherwise noted, the entire contents of this publication are copyrighted by Aberdeen Group, Inc. and may not be reproduced, distributed, archived, or transmitted in any form or by any means without prior written consent by Aberdeen Group, Inc.